One of the great things about the empty nest during the holidays is witnessing the enthusiasm with which my daughters feather their own nests for Christmas. In Colorado, we don't have a huge variety of trees changing color come fall. We do have the aspen trees — often called quaking aspen — though. Their magnificent autumn show of color would put to shame any other trees, which just may be why aspens are the primary deciduous trees on the mountainsides, alongside the majestic Blue Spruce and other pines. Welcome back, my friends. For those of you who stopped by on Saturday, I apologize for there being no new post. So happens that Squarespace, my host, had technical difficulties Friday afternoon on into the early hours of Saturday, and I was already engrossed in Bloggy Boot Camp sessions by then. Thankfully things are fine here now, just in time for this moving Veterans Day tribute produced by the husband of my bloggy friend Sandra Sallin. Sandra was kind enough to grant me permission to share her husband's video, When I Come Home, with you. I'm back from visiting my grandsons in the desert. My bottom-line wrap-up: 'Twas a short but sweet time together. In the four days I had with Bubby, Mac, Megan and Preston (plus Roxy the dog, too), I came away with 2,068 photos and 14 videos on my camera, plus 41 photos on my iPhone. Oh, how I love these boys! If you follow Grandma's Briefs on Facebook, you likely already saw this precious shot of the snuggle-bunny brothers. You may have even seen it in my sidebar (over there to the right), as I couldn't help but make it my new "Who's Who" shot of Gramma's favorite boys. Call it overkill, if you will; I call it a perfect picture I simply had to share again and again. I hope your time while I was away was equally picture perfect, and I thank you again and again for joining me for this week's GRAND Social No. 75! For another grandparent linky, visit Connie's Say It Saturday Link Party each Saturday. Welcome to GRAND Social No. 74. That's seven four... SEVENTY-FOUR. For 74 weeks running, I've hosted a link party for grandparent bloggers and readers. And the surprising thing? For 74 weeks, bloggers and readers have joined me! Meaning super posts from super grandparent bloggers have been shared then read by equally super readers. Very cool. Thank you all very much for making the GRAND Social such a success. And thank you for showing up once again for today's GRAND Social. Before kicking off GRAND Social No. 74, though, I'd like to share with you a great deal for those who are already working on their holiday shopping. Or for those who just plain like Shrek and would enjoy this Broadway production that received eight 2009 Tony Award® nominations including Best Musical, winning Best Costume Design of a Musical and received a Grammy Award® nomination for Best Musical Show Album. 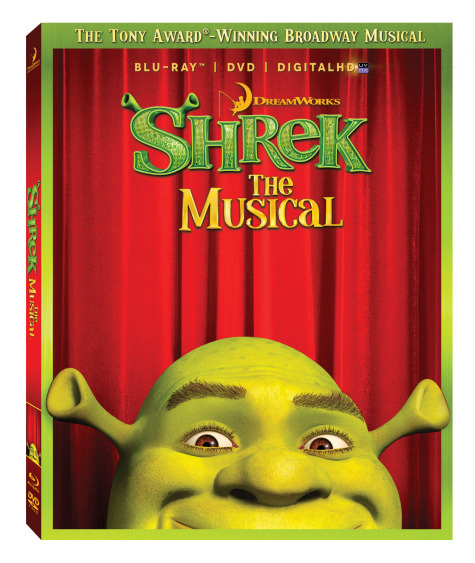 Shrek The Musical, from DreamWorks, is out on Deluxe Blu-ray and DVD tomorrow. I honestly had no idea until being contacted that there was such a show, but I've been promised I have a review copy on its way to me and I will soon post my review. But in celebration of the DVD going on sale tomorrow, Tuesday October 15, I have a discount code to share with you in advance of my review — just so if you planned to get Shrek The Musical, you get the deal. 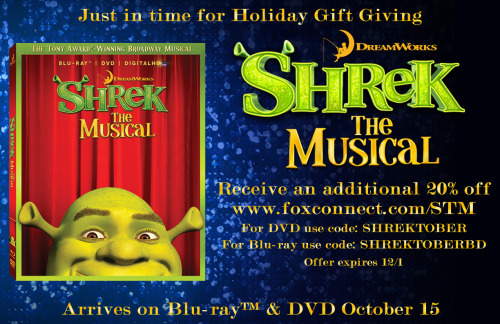 Here it is... a code for 20 percent off Shrek The Musical when purchasing from FoxConnect. Just note the corresponding code below, then click here to purchase either the single-disc DVD ($12.99 before discount) or the Blu-ray Deluxe Edition ($18.99 before discount). Note: Those are not affiliate links. Stay tuned for my review of Shrek The Musical, coming soon to a Grandma's Briefs page near you. Again, thank you for joining me. I have three daughters. Lifting them up and doing all I could to help them cope with getting through girlhood on their way to womanhood was always top of mind for me as a mother. For decades, it seemed the concerns of girls and the issues they face were top of mind not just for myself and other mothers of girls but for society as a whole. In the meantime, boys and their equally scary and scarring issues fell through the cracks. I never really considered the depth of despair mothers of boys might be going through while we mothers of girls had research and support of all sorts to help us muddle our way through raising our daughters. Now that I have grandsons, though, I do consider the plight of boys. Fortunately society as a whole seems to be considering such things a bit more of late, too. I recently learned of a new book that, though I've not yet read it, seems to me like one everyone — parents and grandparents of boys and girls — should look into. I've added it to my must-read list after seeing the trailer last week. I was so alarmed by the stats on boys that I felt compelled to share the trailer with you. This isn't a sponsored post nor is it a review of Masterminds & Wingmen. I simply think we all should find out more about how to lift up our sons and grandsons and help them cope in their journey from boyhood to manhood. This book might shed light on how to do that. If you know of other resources that could further make a difference for boys, feel free to share in the comments. 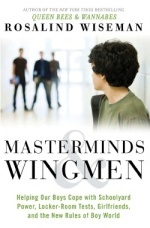 And if you read Masterminds & Wingmen, I'd love to know what you think. I'd also love to see you participate in GRAND Social No. 70 — by either sharing a link, reading the links of those who share or both. Let's dive in! He's no JJ... but he's close.Welcome back! I hope your Grandparents Day was grand. Though the holiday isn't a huge celebration around my place — another drawback of long-distance grandparenting — Jim and I did get a "Happy Grandparents Day" Facetime call from Bubby and Mac. Hulk aside, the majority of my Grandparents Day was spent with my sister Debbie. Brianna, Jim and I visited her in Denver, where she's still in ICU, still befuddling top-notch doctors with her severe pulmonary arterial hypertension. We all have faith in Debbie's doctors at University of Colorado Hospital — it's ranked No. 2 in the nation for pulmonology by U.S. News & World Report, second only to Mayo Clinic in Rochester — yet it's still so terribly frustrating for us all (Debbie more than anyone, of course) to not have a quick fix for my sister. Your continued healing thoughts and prayers are greatly appreciated as there's yet to be a guesstimate as to when Debbie will be released from the ICU, much less the hospital. I also appreciate you joining this week's GRAND Social No. 69. If you're new to the GRAND Social, I'm delighted you've joined us. If you've been here before, thank you so much for participating again. Today the school bell rings and Bubby sets out on his education journey. First stop: Kindergarten! Meeting a new teacher can be a wee bit scary for little ones, but not Bubby, for his teacher is none other than his mom! This will be Megan's first year teaching at a public school rather than private, and she and Bubby both lucked out with her kindergarten assignment. Good luck and best wishes to Bubby on his first day in kindergarten! Good luck and best wishes to my daughter Megan, too. Cheers to a great year for all kiddos and all teachers as the school bells ring! And for all us grandparents and other Grandma's Briefs readers, cheers to GRAND Social No. 65! Thank you for joining me! Sometimes it seems truly surreal how quickly time flies. I feel like I just got to the desert to visit my grandsons yet it's already time for me to fly. I just love those boys more than words can express. (Yes, even when Mac is being a typical two-year-old turd and refusing to joyfully participate in an impromptu photo session with Gramma.) I'm sure you all get it though. I'm sure you have the exact same thoughts and feelings about the kiddos in your lives — in terms of love and affection, that is, not sentiments on uncooperative toddlers. In other news, it also seems like we just had the GRAND Social link party, as well. Time for another, though, so here goes: Welcome to GRAND Social No. 61. Thank you for joining me! Welcome back! I hope the weekend was a grand one for all. As I mentioned Friday, I planned to avoid going online as much as possible over the weekend. And avoid it, I did. Saturday I didn't even turn on my computer — something unheard of, something not done in the past four years. Seriously. • Starting the weekend by enjoying a cup of coffee on the deck rather than promoting my posts on social networks. • Digging up and getting rid of three dead aspen trees in my front yard — all by myself, thankyouverymuch! • Enjoying a pedicure with Brianna. • Weeding my entire front yard (which is not a lawn but a, well, hmm... a faux riverbed accented by cairns and rock outcroppings... sort of). • Weeding my flower beds and pumpkin/zucchini/cucumber patch in the back yard. One of my begonias — which seems to feature a yellow-haired angel. The wild roses have bloomed! A not-so-yucky yucca from across the street. And that was just Saturday. My entire weekend proved delightful, and I look forward to enjoying more in a similar manner — minus the aspen tree elimination — throughout the summer. Now for GRAND Social No. 55. Thank you so much for joining me!